Tom Coulson was called to the Bar in 2014. 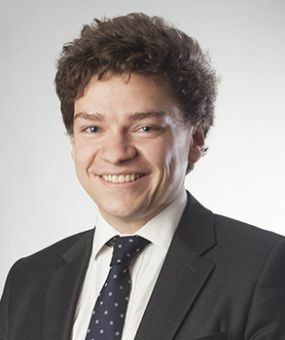 He became a tenant at Keating Chambers, following the successful completion of his pupillage, in September 2015. Tom is familiar with a wide range of contract types, including the various JCT and NEC forms, the RIBA standard forms of appointment, as well as bespoke construction contracts and PFI/PPP agreements. He has represented his clients in court, both at an interlocutory stage and at trial. During his time in Chambers he has also gained experience of the resolution of disputes by arbitration, adjudication, and mediation. Tom accepts instructions to advise, represent clients, and draft pleadings in relation to a broad range of commercial law matters, with a particular emphasis upon construction and engineering, professional negligence, and public procurement disputes. Instructed (as sole counsel) for a sub-contractor in a dispute concerning its entitlement to interim payments under a JCT Standard Building Sub-Contract (value c. £700k). Advised a home-owner in relation to rights to terminate a building contract for repudiatory breach, misrepresentations, and ownership of plant and materials. Drafted Particulars of Claim in a dispute involving issues of delay, termination and final account entitlements (value c. £160k). Drafted a Reply and Defence to Counterclaim and a Response to an RFI in a dispute concerning M&E works (value c. £100k). Instructed by a property development company in a dispute concerning the delayed and defective provision of utilities services. Instructed (as junior counsel) in a dispute concerning the fabrication and installation of engineering plant components. Assisted (during pupillage) in a dispute concerning entitlements to loss and expense and extensions of time under an NEC contract. Assisted (during pupillage) in a final account dispute under a JCT Minor Works Building Contract. County Court trial for a building contractor, successfully defending a claim relating to the erection of scaffolding. Appeared for a major telecoms provider in a series of County Court trials, successfully defending claims brought by consumers and commercial entities. CCMC on behalf of an employer in a multi-track dispute worth c. £80k. Contentious issues included costs budgets, relief from sanctions and disclosure. Residential possession proceedings in the County Court. Instructed for the Defendant in an architect’s negligence dispute, involving allegations relating to inspection, certification, and administration of the building contract. Instructed for the Claimant in an architect’s negligence dispute concerning the negligent design of an industrial floor. Assisted (during pupillage) in a claim against an engineer relating to the design of a warehouse floor that also raised various issues under the Limitation Act 1980. Assisted (during pupillage) in an architect’s negligence claim that raised issues of design, inspection, and the operation of a net contribution clause. Instructed as junior counsel in an adjudication under an NHS facilities management contract. Instructed to draft Notice and Referral in for a claim for approximately £700k involving issues as to the validity of Payment and Pay Less Notices. Instructed to appear at a CMC in adjudication enforcement and counterclaim proceedings. Instructed by a major homebuilder in an adjudication under the Consumer Code for Home Builders Adjudication Scheme. Assisted (during pupillage) in numerous disputes concerning the enforcement of adjudicators’ awards. Instructed as junior counsel by a major facilities management company in a series of disputes arising out of the provision of services to various NHS entities. Instructed in a dispute concerning the long-term provision of maintenance services to a social landlord (value c.£770k). Assisted (during pupillage) in a dispute concerning interpretation and/or rectification of a payment formula in a PFI contract. Assisted (during pupillage) in a dispute concerning payment under a PPP contract for the supply and treatment of water. Assisted (during pupillage) in a dispute under an NEC3 Term Service Contract for maintenance and repair work. Instructed (as junior counsel) in a challenge to the award by the Lord Chancellor of contracts for firms of solicitors to provide criminal law legal aid services. Instructed as part of the counsel team by the GLD / Treasury Solicitor in a dispute arising out of a procurement conducted by a Government Department. Advised on the merits of claims against statutory undertakers under the Water Industry Act 1991 and at common law. Instructed by a major telecoms provider in a series of consumer disputes. Advised in relation to winding up proceedings. Keating on Construction Contracts 10th edition, contributor (2016). Tom retains a strong interest in history of all types and periods and also enjoys playing Sunday league football.